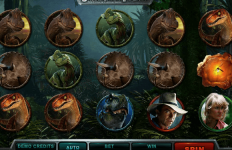 Browse: Home / Will you cause Max Damage to the new alien attack slot? The first Max Damage and the Alien Attack slot was innovative for its exciting gameplay that combined arcade-style games playing along with the chance to win big prizes as you took on the role of Max Damage, fending off the invading alien hoard. In this sequel, Microgaming have reverted back to a familiar slot style offering 5×3 reels and 243-ways to win on this intergalactic slot, that harks back to the glory days of the 80’s arcade. The new Max Damage slot boasts more than simply space-themed symbols and Max Damage as its central hero, the action takes place both in earth’s upper atmosphere and in deep space as Max takes on another perilous alien threat. The game is brought to life by outstanding graphics and animations and a thumping soundtrack, inspired by both 80s arcade games and the frantic finale of the first Max Damage game. In terms of gameplay, the Max Damage slot offers stacked wilds, three-high, across all five reels, which give Max an increased chance of landing a knockout blow. 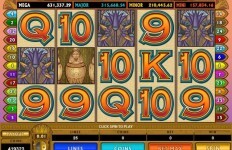 Land 3 or more scatter symbols and you’ll enter the free spins section. Here you receive 15 free spins and all wins are doubled thanks to a generous 2x multiplier. However, in free spins, an Alien Spaceship Scatter symbol will appear on each reel. If this lands on the screen, Max lasers will destroy the shop, revealing a fantastic random cash bonus (this bonus is not subject to a 2x multiplier however). 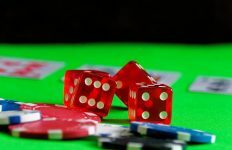 The action is fast and frantic and this exciting follow up slot to the first game is sure to be a hit with slot fans across the galaxy and beyond. 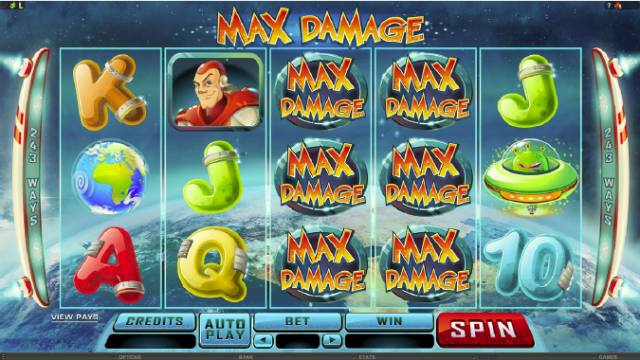 Play Max Damage slot at your favourite Microgaming Luxury online casino soon and you stand a chance of winning the galactic-sized jackpot of 120,000 coins all from a single spin of the reels. Feel free to visit our Danish partner site, which offers this spillemaskine game in Danish as well!